Italian rider Cristian Moreni has become the second rider in a week to fail a Tour de France doping test. Moreni's positive test for testosterone was revealed a day after pre-race favourite Alexandre Vinokourov's positive for blood doping. 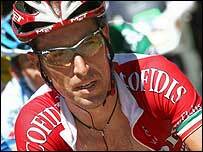 Moreni's Cofidis team, which also included Britain's Bradley Wiggins, withdrew from the Tour as a result. The 34-year-old's test took place after the completion of last Thursday's 11th stage from Marseille to Montpellier. Moreni, who was in 54th place after Wednesday's stage, admitted his guilt and did not ask for a B-sample. He was led away by police once the stage had finished. Urine tests are conducted daily at the Tour on the stage winner, the race leader and other selected riders. Eight riders were tested after the stage: stage winner Robert Hunter, yellow jersey Rasmussen, Maxim Iglinskiy, Erik Zabel, Lilian Jegou, Moreni, Kim Kirchen and Patxi Vila. Kazakh rider Vinokourov tested positive for blood doping after winning Saturday's time-trial stage, his team Astana withdrawing from the race as a result. Cofidis was one of eight teams which delayed the start of Wednesday's 16th stage by 13 minutes with a protest. Tour leader Michael Rasmussen went on to win the stage, which finished on the Col d'Aubisque. Moreni finished over 21 minutes behind him. The eight teams - six from France plus German outfits Gerolsteiner and T-Mobile - have formed a Movement for a Credible Cycling, asking for all teams to abide by their good behaviour charter of 2005. Under the charter, teams are requested to avoid fielding riders implicated in doping affairs. Even before Tuesday's bombshell, Rasmussen was battling suspicions for missing pre-tour doping tests. The Dane was booed by fans on the way to the start line on Wednesday but still seems likely to claim victory in Paris on Sunday. A week ago, T-Mobile rider Patrik Sinkewitz was revealed as having tested positive for elevated levels of testosterone before the Tour began. He had already abandoned the race following a crash. Meanwhile, 2006 champion Floyd Landis has been prevented from defending his crown for failing a drugs test during last year's Tour while Giro d'Italia winner Danilo di Luca is also being investigated. In addition, 2006 Giro winner Ivan Basso was recently handed a two-year ban and 1996 Tour de France winner Bjarne Riis admitted using performance-enhancing drugs, as did five former Telekom team-mates.